School and then went on to Massachusetts College of Art and Wentworth Institute, where he received a Bachelor of Science degree. In 1934, Curtis began teaching in the art department at Gloucester High School. That same year, Curtis landed a secondary job as assistant to artist Frederick L. Stoddard who had been commissioned through the Works Progress Administration (WPA), to create murals for the interior of Gloucester’s Sawyer Free Library. Over the next three decades, Curtis oversaw the restoration work on Stoddard’s murals at the Sawyer Free Library. In 1976, Howard Curtis was commissioned to paint his own murals at Saunders House. He also painted murals in the Gloucester Police Station, the Prospect Street Methodist Church, and the Riverdale Methodist Church in Gloucester. Howard Curtis played an important role in Gloucester’s art community for over half a century as a devoted caretaker of the many irreplaceable paintings and murals scattered throughout the city’s municipal buildings. In 1982, well into his seventies, he oversaw the installation of the historic Frederick Mulhaupt murals at the O’Maley Middle School in Riverdale. Howard Curtis is the brother of noted Gloucester artist and writer Roger Curtis and the uncle of artist David Curtis. 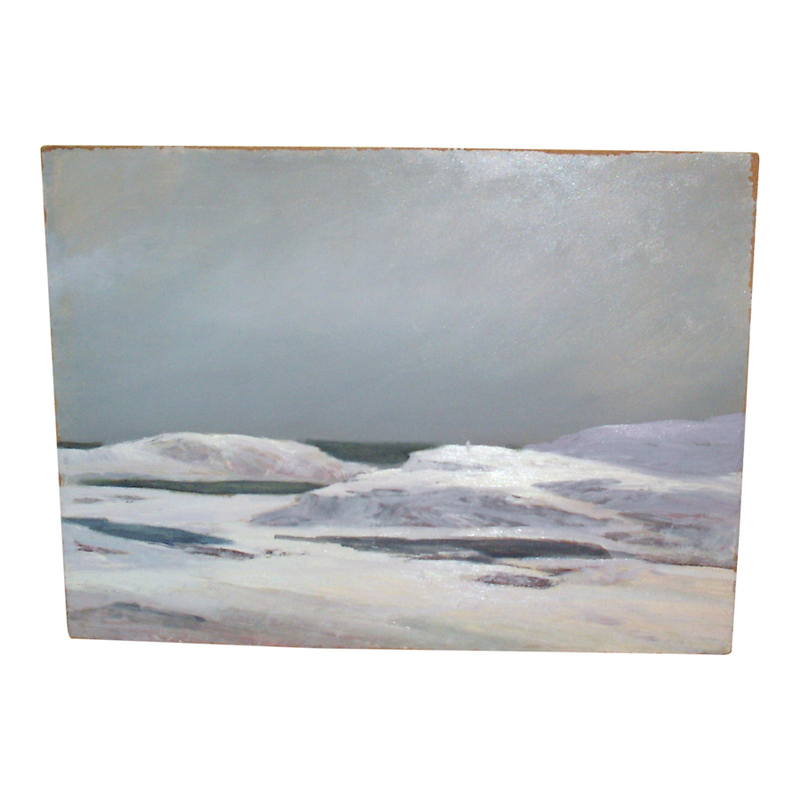 This oil on masonite is not signed but comes to us through his estate. CONDITION: in a ebonized wood frame.